Of the newer varieties which have been considerably proved, none appear to be more generally admired than the Doyenne Boussouck. for size, growth, productiveness and quality. We have never heard a word against its high character. The Beurre Langelier is regarded by Hovey as the best early winter pear, and is highly esteemed by Manning, Walker, and others; while on the other hand, Manning thinks the Lawrence is decidedly the best, so far as a partial trial will in-dicate. Col. Wilder finds the Doyenne gris d'Hiver Nouveau of good quality, and ripening later than Easter Beurre ; the Howell large and fine; the Triomphede Jodigne. " good;" Nov-veau Poiteau, handsome and fine: and Soldat Laboreur a beautiful grower and a fine pear. Van Mon's Leon le Clerc. as elsewhere, cracks badly with him, and the Dix very badly. Some of the worst looking specimens of cracked pears observed anywhere, wore on a tree of the Dix. Has this new and hardy American tree already reached old age? Or will it die of old age at Dorchester, at the same time it is flourishing in youth and vigor near Rochester? 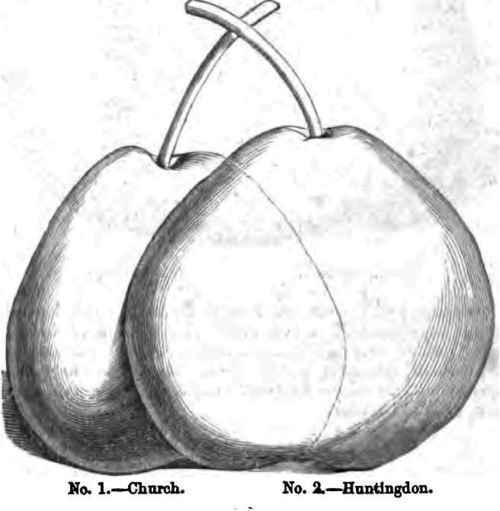 A puzzling fact in relation to cracking, occurred on the grounds of the writer, - a young Doyenne pear on new ground, while bearing its first crop, became dotted with black specks, precisely like those of leaf blight, on both leaves and fruit at the same time, and the fruit cracked and was worthless. This was some years ago, and has not been repeated. Not far distant, on very similar soil, stood another old Doyenne tree, bearing yearly six to twelve bushels of uniformly fair fruit. This fact is very adverse to the theory of exhaustion of toil by trees of long standing. 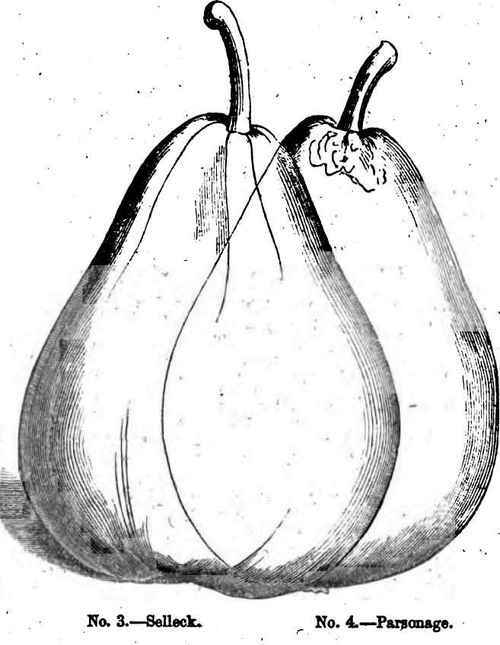 Robert Marking has found only two of Knight's pears of much value, the Eyewood And Moccas. The Monarch, after a vast amount of pains to get it correct, proves alter all, of no great value. Manning's Elizabeth, he regards as one of the finest early pears. The Duchesse d) Orleans promises to become very valuable. Of Gov. Eewakos' new sorts, the Calhoun proves the best, and the Dallas a good fruit the others not so worthy of notice. Why, my dear Doctor, you are so flooding us with new pears that we shall be utterly at a stand in our choice of what to cultivate, for the simple dozen varieties of which we stand in need. But it is "the trade" of the nursery men to give us new things; and if they but prove good, no one need complain that so numerous varieties are offered for his choice. A seedling from New Rochelle, N, Y., medium size; stem, about one inch; skin, bright green, turning to yellow green in the process of ripening, spotted and marbled with hazel russet, which russet always surrounds the cavity. Calyx closed, basin medium, segments little apparent. Flesh battery, very juicy and melting; sweet, aromatic, best. Ripens-slow-ly from 15th Jury to first week in August; keeps well and long when ripe without rot at the core. In my opinion one of the best. Another New Rochelle seedling; medium size or below medium, with a rather slender and long stem, in a moderately deep; broad, and uneven cavity. Eye closed in an abrupt basin, dotted with a few russet 'circles. Skin green, often colored around the basin and upwards with a crimson tinge. Flesh melting, very juicy, buttery, with a peculiar, very delicate flavor. Ripens well (middle or latter half of September); a very good pear. Large handsome fruit. Skin green, turning over to bright yellow (the color of the Bartlett), when ripening; which it does slowly and without decaying at the core. The surface of the fruit is uneven, ribbed and knobbed. It has the flavor of the Bartlett, its juice and its melting flesh, with a great deal more sugar and relish. A superior fruit, in my opinion, if it succeeds as well South as in its native latitude. Ripe end of September and commencement of October. - B. Another chance seedling of New Rochelle. Stem, half inch or three-quarters long, stout, sometimes a little inclined, slightly sunk, with a very distinct russet cap around the shallow cavity.. All over spotted with russet, but more at the basin, which is shallow and broad. Eye open; segments stiff; a little erect; skin greenish yellow. Keeps long and fair after turning over to bright yellow or orange. Flesh white, melting, juicy, sub-acid-vinous, refreshing flavor; a very fine market pear on account of its size, quality, and handsome keeping. Good, or very good. End of September and first week in October.